I enjoy a good mystery and one that includes Soviet forces, Nazi regimes, lost art and conspiracy theories rather hits the spot. Construction of the Amber Room began in 1701 in what was then Prussia. It was originally built for the Charlottenburg Palace; a residence of Frederick the First King of Prussia at the request of his wife and it really was beautiful. 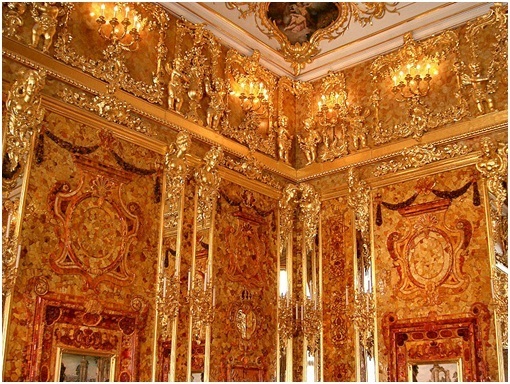 Huge panels of amber baring encrusted gemstones, gold leaf and mirrors walled the border of the room; while the cabinets and other furniture was built in a similar style. In total over six tonnes of amber was incorporated into the design. After many years of construction the panels, which were bound for the Charlottenburg Palace, instead made it to the Berlin City Palace, a second residence of King Frederick. However on a visit from the Imperial Family of Russia in 1716 Peter the Great took a fancy to it and it was given as a state gift to the Russian Empire. The panels and furniture were moved to the Charlotte Palace in Russia; the Family’s summer residence. And so it remained; a world famous collection of beauty for over two hundred years. In that time both Prussia and Russia had changed into Germany and the Soviet Union and… well tensions had become a little strained. During the Second World War the German invasion of the Soviets was famously unsuccessful but in that time plundering was rife. The same Soviet team that had hidden most of the state treasure and art in Leningrad tried to dissemble the Amber Room so that it could be packed away. Unfortunately over two centuries the amber had grown too brittle and was crumbling to the touch. Instead the team decided to build fake plasterboard walls over the panels in an effort to hide them. This approach was unsuccessful and Nazi looters (under the supervision of several experts) dismantled the panels and transported them West. Like many other war acquisitions from the Eastern front, the Amber Room ended up in crates at the city of Königsberg (at which point the heavily mathematical readership of my website prick up their ears: sorry no bridges or topology today). Some of the panels were unpacked slightly and there was a small display of them at Königsberg castle in 1941 about a month after the looting. This is the last, absolutely confirmed by everyone sighting of the panels. By the end of the war Adolf Hitler had ordered the movement of the top tier treasures away from the front, but this was mid 1945 where the command structure of the Nazi regime was in disarray. The leader of the civil administration in Konigsburg who was responsible for the movement of these goods fled the city leaving the possessions there which the Red Army recaptured on their arrival. However Königsberg Castle suffered huge barrages from artillery fire; which combined with the damage to the treasure that was done by RAF bombing the previous year, destroyed much of the Amber Room. How much remains is a surprisingly controversial subject. Several eyewitnesses claim that several panels were loaded onto the German ship the Wilhelm Gustiloff before it was downed with torpedoes although no scuba survey has been done. Many smaller pieces have turned up in the hands of the families of German soldiers who were part of the original stealing from Russia, but only trinkets have been recovered so far. Whenever one turns up it is sent to the reconstruction effort which is much less grand at only half a tonne of amber, but even the reconstruction is valued somewhere between $150 million and $500 million. Part of the reason that there is a controversy is that none of the countries want to either admit they accidentally destroyed it, or that it was destroyed on their watch. The Soviets can't allow it to be known that they destroyed something that once made Russia world famous, even if it was linked to the Royals they toppled. The Germans refuse to let it known that it was the disorganisation of their regime that let it slip from the radar and so both governments keep putting out statements that it probably still exists. Conspiracy theorists and treasure hunters (which I imagine have a large intersect on their Euler diagram) have jumped on this fact and remain hopeful, propped up by the occasional find from the families of looters. During the cold war the Soviets played heavily on the propaganda opportunity which arose around the stealing of Russian treasure by Germany. Overall it seems increasingly unlikely that the full treasure will ever be found. My prediction is that we will continue to get occasional “family heirlooms”, but the bombing to nothing from both the RAF and the Soviets was the most likely result. In 1968 the Soviet Premier Leonid Brezhnev tore down the Königsberg Castle and so if the Amber Room's hidden panels where still contained there then they have probably gone forever. The only hope is in the continuing searches in the surrounding towns.